This is one of those intriguing products, perhaps on what it could have been more than what it is. 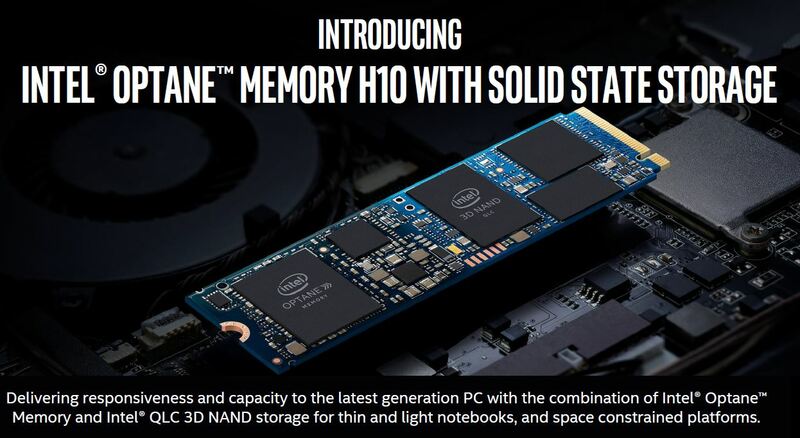 Intel Optane Memory H10 with solid-state storage combines Intel Optane with QLC NAND onto a single M.2 package. What is more, with Intel RST, Intel has intelligent caching systems at play. While this is indeed very promising, there are some catches that we want our readers to be aware of. Getting down to the details, the Intel Optane Memory H10 essentially fuses together what has traditionally been two components. On one half of the M.2 drive is Intel Optane Memory. On the other half is QLC NAND. The appeal of putting up to 32GB of Optane and 1TB of QLC NAND in a single M.2 device should be clear to STH readers. Only one slot is required instead of two. To make this work, Intel needed to add an Intel Optane Memory media controller along with a single package of either 16GB or 32GB of Optane. 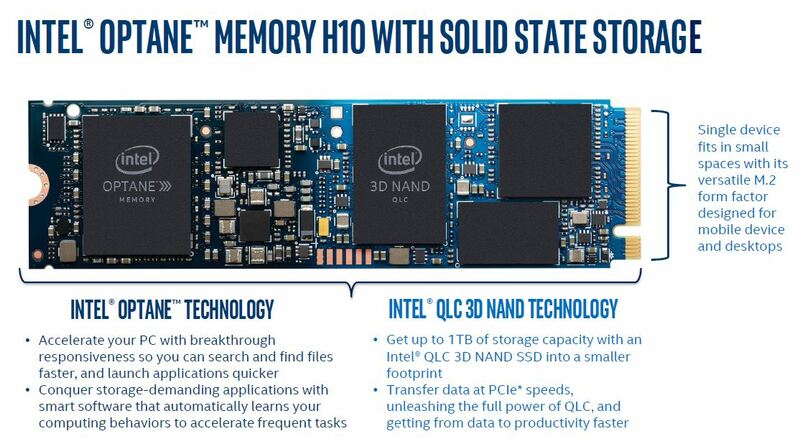 On the SSD side, Intel needed to fit a NAND package, a QLC controller, and a DRAM package. One day, we would hope that bit addressable and persistent Optane could be a replacement for the DRAM on these types of packages which could allow for PLP without additional capacitors. Here are the key specs. 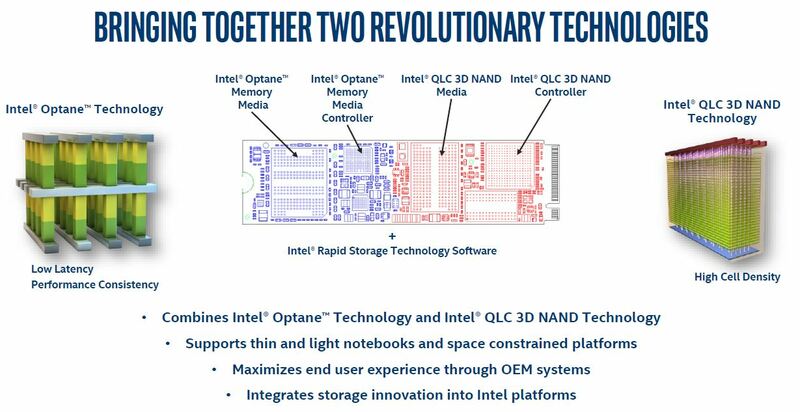 Intel is touting QD1 and QD2 performance given the Optane onboard. Capacities are 16GB + 256GB for lower-cost segments and then 32GB of Optane combined with either 512GB or 1TB of QLC NAND for higher-capacity and cost applications. For host devices, Intel has very limited support, and one needs Intel RST for caching to work. Our readers thinking this could be an excellent SSD for embedded appliances may want to take a look at the system requirements. In terms of where this fits, Intel places it between the Intel Optane Memory M10 and the Intel Optane SSD 800P. It is a long way away from the Intel Optane 905P 380GB M.2 NVMe SSD we reviewed. Overall, we like where this is going. On the other hand, it seems like this is a generation or two before this becomes an absolutely killer device. 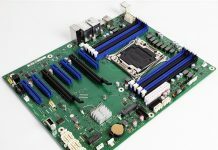 If Intel had a controller that could manage both types of media and caching we likely would see a lower cost device with fewer components, especially if the DRAM could be eliminated. We expect that at some point Intel will do further integration. This is a step where what would otherwise be two physical devices is now one with the Intel Optane Memory H10 device. We like this direction from Intel. Any details on Linux support? What I would really like is just have it display as two separate block devices (nvme0n1, nvme0n2) that I can use however I like. According to ARK, the H10 series supports both Enhanced Power Loss Data Protection and End-to-End Data Protection. @Jesper – just tell Intel how much money you have to spend and it will cook up a SKU to match that number. according to “accidental tech podcast” (75k listeners) schools load 30GB profiles with every login, which is why apple still ships mechanical drives to schools. sticking that on an optane with the flash for overflow would solve the endurance issue. Locked into Intel… Oh well, might as well not exist. This seems rather disappointing. I like the idea a lot, but the implementation seems very flawed. I think the Optane cache should be invisible and managed for you, rather like the ZIL/SLOG on a ZFS array. Requiring RST and software support for this really limits the use cases and the potential of the hardware innovation.